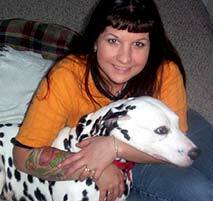 Here is a photo of Andi with her dog Coal. Jake came across this extraordinary artist who's work is among the best we've seen! The artists name is Andi and she has been tattooing firefighters for a number of years. I think you'll agree she has a style all her own that adds that something special to the tattoos she has inked. Andi works at a shop called the "Red Octopus" which is in Maryland. You can see more of her work on the studios web site which you can get to by clicking the image on the left. Below are a few of the awesome designs she tattooed on firefighters. Just click the thumbnail to see a larger image and who the collector of the tattoo is.